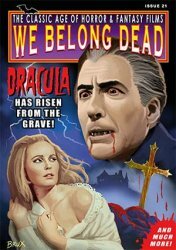 MyMovieMonsters.com > Monster Magazine Marketplace > We Belong Dead (UK) > We Belong Dead Magazine #21 - Dracula Has Risen from the Grave - FINALLY HERE! Issue #21 - Winter 2019. Size A4 (no longer published in digest-size). 100 full-color pages. Printed in the UK. We also offer additional back issues while supplies last. Important Shipping Note: Save on shipping by purchasing this magazine and one or more additional magazines. This magazine with the cardboard shipper weighs more than 1 lb and must ship Priority Mail rather than First-Class. Indicate at the drop-down menu above if you wish to purchase this magazine by itself (Priority Mail postage will be added) or if you have additional magazines or other items in your order. If you choose "additional items" but only purchase this item, your order will require postage and your order will be delayed. 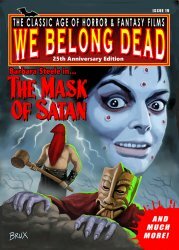 We Belong Dead Magazine #19 25th Anniv. Ed. - Spring 2017 - Mask of Satan!